In the setting of the XXI Triennale International Exhibition, within the Rooms. Novel living concepts exhibit, Natuzzi announces its collaboration with Salone del Mobile and Fabio Novembre, participating in his new project Intro. Curated by Beppe Finessi and supported by Salone del Mobile, Rooms. Novel living concepts is hosted in the Triennale in Milan from April 2nd to September 12th, 2016. Intro is an abstract uterus, an egg-shaped alcove that literally swallows the visitor, to then return them back to the world, reborn and more aware. 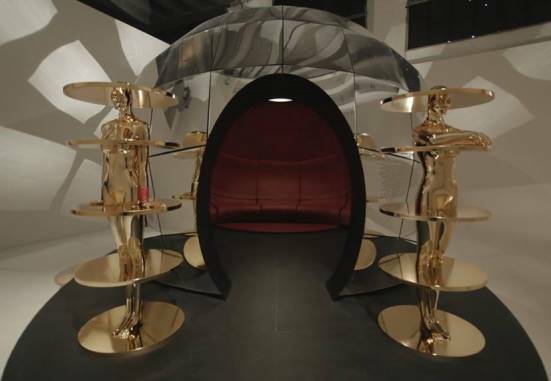 Fabio Novembre worked on the idea of a bedroom, integrating it into the most perfect and ancestral shape: the egg. A source of life and transformation, the outer layer made of mirrored metal conceals a warm leather room, intensely red in color. The installation’s interior depicts a negative of a face which, thanks to the play of the chiaroscuro, seems to protrude into the interior of the room. The anthropomorphic shapes, a distinguishing marker in the designs of Fabio Novembre, are also found outside the room, where two feminine figures guard the entrance to the space. Pasquale Jr. Natuzzi, Nautzzi Communication and Creative Director, stated: “Intro represents a virtuosity which allows us to impart on visitors the know-how and craftsmanship that has always distinguished the company”. In fact, Natuzzi has produced the entire installation using above all the materials which are used to produce sofas like wood, to create the base of the installation and leather, the main character in this creation. Intro is a complex puzzle of different material, all assembled by hand: thermoformed acrylic panels covering a wooden nesting, giving life to an sloping spherical structure composed of 12 elements. The interior, on the other hand, required all of the brand’s and its craftsmen’s know-how for covering in leather the inner walls in anthropomorphic shapes so to create an intimate and sensual alcove.